My designs are created to be as beautiful as they are wearable, from evening gown adornments to jeans and t-shirt accessories. The craftsmanship of each piece is unique, combining timeless design with fiber-inspired, contemporary jewelry techniques. Pieces are crafted with stones including Turquoise, Pearls, and Labradorite. Each Gem is woven, sewn, wrapped, knit or crocheted in Sterling Silver, Gold-filled wire, and 18k Gold vermeil. They are meant to artfully enhance, but not outshine your look. Ranging from large, regal necklaces to fun, elegant earrings, there is truly a design for every woman. Go straight for the style you are looking for, or browse through various collections highlighting my signature, complementing pieces. I specialize in Necklaces, Bracelets, and Earrings, which can be customized to fit your preference and taste if indicated. 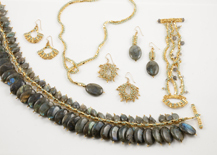 The Alessandra Collection showcases dynamic Labradorite stones in a variety of styles. Labradorite is traditionally regarded for its mystical gifts of wisdom, calmness and intuition. 18K Gold Vermeil, Czech glass beads, and Swarovski crystals enhance the deep blues, grays and greens of this color changing stone. The effect is a luxurious, magical completely wearable finish. The Athena Collection is a celebration of Turquoise. 18K Gold Vermeil, Swarovski crystals and Czech glass beads are the perfect complement to this popular stone. Inspired by Roman and Greek art as well as Native American jewelry, this collection blends elegance with classical styles and earthy tones. Pieces from this collection can be paired with both casual styles and eveningwear to enhance your personal style. Add presence, strength, and sparkle to your style with a piece from this shimmering gem collection. The Elizaveta Collection combines Swarovski crystals with Sterling Silver and 18 K Gold Vermeil for dynamic, versatile jewelry. 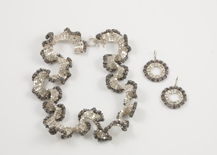 Sparkling studded beads accent many of these pieces for added brilliance and shine. Standing out in the crowd was never so easy. There is a princess in every one of us. 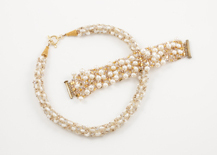 The Genevieve Collection combines white fresh water pearls, dazzling Swarovski crystals, and elegant 18K Gold Vermeil for a royal finish. Subtle rose-colored glass beads accent many of the gems in this delicate, refined collection. After all, every woman deserves a touch of fairy tale couture in her wardrobe. The flowing, delicate style of the Lia Collection is meant to look like luxurious, curling fabric. These pieces are actually weighty, durable, and very flexible. The Lia Collection marks the true workmanship of the art of jewelry stitching as the gems seem to become sterling silver fabric themselves. Named for the “tornado” style beads that decorate these gems, the Tempest Collection is crafted with the art of hand stitching and wrapping. The “tornado” beads are fun, unique elements that have been wrapped with sterling silver wire. 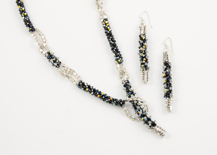 These pieces are accented with sterling silver beads, Swarovski crystals, and colored glass beads for added glisten.